2. 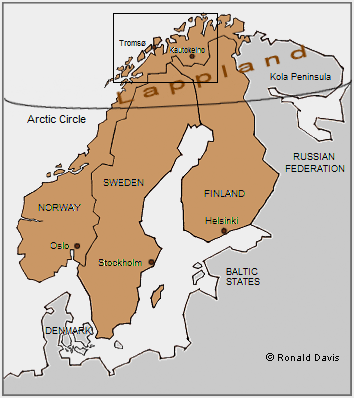 Lappland, also spelled Lapland, the ancestral home of the Saami, or Lapps, comprises northern Norway, Sweden, Finland, and the Kola Peninsula of Russia. "The Saami paintings are magnificent." "I became interested in the nomadic Saami as a subject for my work. The Saami are descendents of a hardy, hunting and gathering people who lived in the northern extremity of Europe and were recorded as early as 98 A.D. by the Roman historian Tacitus. "During the spring and summer of 1976, I did research in libraries and bookstores in New York City in preparation for my prospective work. Ronald, who was overseeing the national tour of The Performing Arts in America exhibition, assisted me in planning the project, charting an itinerary, and deciding where would be our ultimate destination in Lappland. "Our immediate concern, however, upon which everything depended, was being able to finance the project. Anticipated costs would include art materials, transatlantic and regional transportation, meals, lodgings, and supplies for a planned time period of six to eight weeks. The Performing Arts in America exhibition was having a successful tour and, fortunately, generated purchases of my paintings and drawings that would make the project in Lappland possible. ''Leaving New York City that September, I felt a kinship with Gauguin, who had left a great metropolis and flourishing art center, Paris, to seek inspiration for his work among people living in a remote part of the world - for him, native Tahitians, in the South Pacific; for me, nomadic Saami, beyond the Arctic Circle. ''But once there, would I meet individuals willing to sit for a portrait, as the Saami are a mobile people who follow the seasonal migrations of the reindeer from elevated pastures along the seacoast in spring and summer to the bleak tundra, where October snowfalls announce an early winter and the daylight hours diminish with increasing rapidity." The Bibliothèque Nationale de France states in its biographical essay on Stanley Roseman that the artist has "a profound interest in the human condition in portraying different kinds of people, professions, social or artistic groups." Roseman's interest in the nomadic Saami as a subject for his work took the artist and his colleague Ronald Davis in 1976 beyond the Arctic Circle to the windswept tundra of Norwegian Lappland. 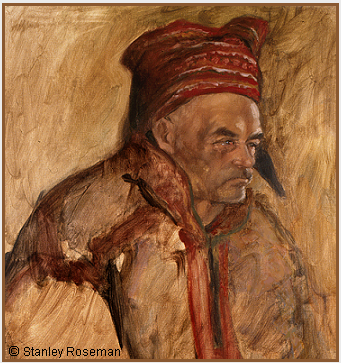 There Roseman painted critically acclaimed portraits of the Saami, a hardy, independent, reindeer herding people who maintain their centuries-old, nomadic way of life in one of the earth's harshest environments. The Times, London, praises the artist's work in Lappland as "an epic project" and states: "The Saami paintings are magnificent." 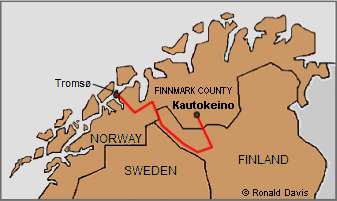 Roseman and Davis left Tromsø and drove some 400 kilometers on the one main road that led them east through Norway and into Finland from where they travelled southeast before turning north to recross the Norwegian border and continue on to the rural township of Kautokeino, situated just above the 69th parallel. A selection of Roseman's paintings and drypoint engravings on the Saami People of Lappland; a narration of Roseman and Davis' fortuitous meeting in Kautokeino of the anthropologist Myrdene Anderson, who introduced the artist to members of the Saami community; and a presentation from The Saami People of Lappland exhibition at the Peabody Museum, Yale University, is published on stanleyrosemandance.com. Aftonbladet, Stockholm, published in 1980 a cover story on Roseman in the newspaper's Sunday magazine and commends the artist for his approach to his art: ''He lives together with groups of people he wants to portray, seeks their inner self.'' The leading Swedish daily featured the artist's paintings and drawings on the subject of the circus clown, the nomadic Saami people, and the monastic life. Aftonbladet praises Roseman for his work ''on a high artistic level as well as accurately expressive of the human dimension." Roseman's fortitude in overcoming challenging physical and climatic conditions in order to pursue his work; his ability to be mobile, as are the Saami; his empathy with his models; and the resultant paintings earned him respect and admiration. Despite the reserve that those nomadic people held towards those outside their community, a rapport of trust and understanding was established between the Saami and the artist. Issát, following the winter migration of the reindeer, had returned with his wife Sunne Ris'ten and their children to the windswept tundra of the rural township of Kautokeino in Finnmark County. Roseman was invited into the Saami couple's winter dwelling, where he painted the magnificent portrait Issát. In the last quarter of the twentieth century, the Saami, a numerically small, indigenous minority, accounted for less than one percent of the population in Norway, Sweden, and Finland. Finnmark County, in northern Norway, is mostly inhabited by Saami. The majority of the Saami in Lappland have assimilated into the dominant culture and are engaged in farming and fishing, as well as other sedentary occupations. Some ten percent of the Saami are reindeer-herding nomads. The Saami speak their own language, Saami, which belongs to the Finno-Ugric language group, and wear their traditional attire, as does Issát in the Roseman portrait. Vigorous brushstrokes define the reindeer herder's heavy, woolen tunic with its protective, high collar; and his distinctive woolen hat. The hat, cylindrical in shape with dark tubular forms of woolen material emerging from the crown and falling to the back and side, is the traditional headgear worn by Saami men from the region of Kautokeino. The earth colors of umbers and siennas in the painting evoke the hues of the stark Arctic terrain in early winter. 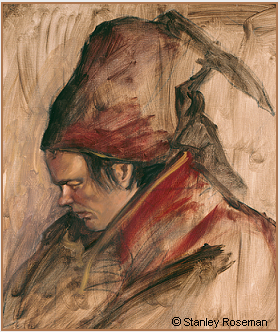 The artist's brushwork in the summary background and the bold abstractions that describe the ample volumes and sense of weightiness of the Saami tunic and hat are complemented by the fine rendering of Issát's face, seen in profile. Roseman has portrayed the reindeer herder, who confronts the harsh, natural elements in maintaining his nomadic way of life, in a moment of quietude and introspection. "The painting radiates such powerful feelings," writes the collector who acquired the portrait of Issát. "They give an overwhelming sense of individuality and humanity." 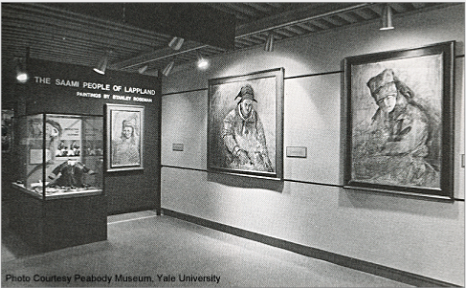 Yale University's Peabody Museum presented The Saami People of Lappland exhibition, 1977. In a laudatory review "Art and Anthropology at the Peabody," The Morning Record & Journal, Meriden, Connecticut, writes in praise of ''The excellent exhibit'' featuring Roseman's portraits of the nomadic Saami with a selection of artifacts and documentary information from the collections of Myrdene Anderson and the Peabody Museum. "I'm fairly sitting in a daze, not quite believing that one of your beautiful Saami paintings is now adorning a wall in my home. The painting radiates such powerful feelings, which is truly inexplicable. Yet I guess it can be explained through the fact that you lived with these people and experienced their way of life. And that is what makes you such a great artist, Stanley - your ability to perceive these people's feelings and to capture them with your brush. I am truly thrilled and proud to have this magnificent painting." Exemplary of Roseman's paintings of the nomadic Saami are the portraits of the reindeer herders Bier An'te, presented at the top of the page, and Issát, (fig. 3, below). (text in French and English), (Paris: Bibliothèque Nationale de France, 1996), p.11. 2. Tacitus, Germania, 98 A.D.